Ever since Daniel Craig dressed in what appeared to be a royal blue Tom Ford dinner suit on some of the Skyfall posters, medium blue became a popular colour for the dinner suit. Rather than in traditional midnight blue, dinner suits lighter shades of blue such as royal blue, cobalt blue, marine blue and light navy were suddenly trendy in an attempt to replicate James Bond’s look on the colour-enhanced Skyfall poster, by Empire Design. This poster, however, spurred many misunderstandings about the colour of the suit that Daniel Craig actually wears in Skyfall and what “midnight blue” means. These bright blue dinner suits are often mistakenly called “midnight blue” because people have heard of the midnight blue dinner suit but don’t understand what it is. True midnight blue is the darkest shade of blue there is. After all, it is named after the colour of the midnight sky. Most people have likely never seen a midnight blue dinner suit in person, and if they did it likely didn’t register as blue. Midnight blue looks black under artificial light at night, just as darker shades of navy do. Only under sunlight does true midnight blue look blue. So when people saw the colour of Daniel Craig dinner suit on the Skyfall poster they incorrectly thought, “so that’s the mythical midnight blue!” People may have confused mid blue for midnight blue. Even many who understand what midnight blue is were still excited to see James Bond in a new brighter take on the dinner suit. Midnight blue does not make a statement, but a bright blue where one expects black certainly does. Neither Daniel Craig, Skyfall‘s costume designer Jany Temime nor clothier Tom Ford are responsible for the medium blue dinner suit trend. The suit that James Bond is wearing in Skyfall and on the poster is in reality true midnight blue, but the poster lightened the colour of the suit considerably. In the film, the suit looks black under the artificial light of the Macau casino. In the natural light on Hashima island, the suit appears to be a very deep blue but nothing as bright as it does on the poster. The poster, however, has stayed in people’s minds more than the very dark blue suit in the film has. 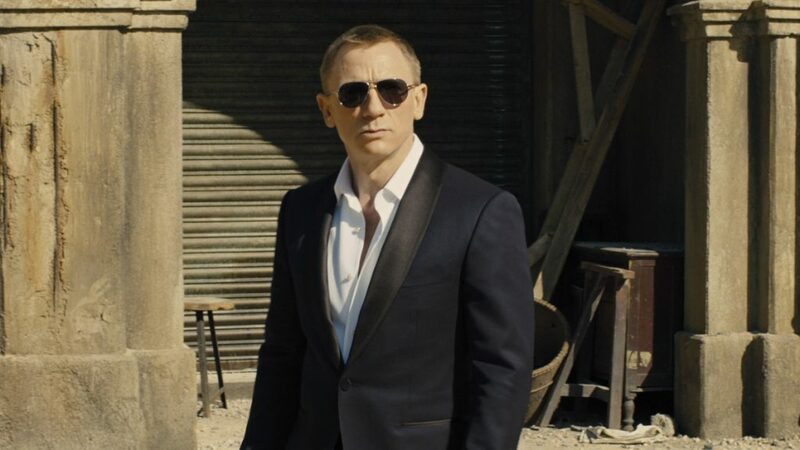 How the Skyfall dinner suit appears in daylight in the film. The colour grading is warm, which makes the suit look a bit less blue than it is in reality, but it’s not far off. The bright colour that the dinner jacket appears to be on the poster is far from the true colours and is only a result of colour enhancement. The blue on the poster is certainly more eye-catching than true midnight blue would be, particularly on a poster with a white background and black type. Empire Design is responsible for putting medium blue and midnight blue dinner suits on the map for the average man. They made Daniel Craig’s midnight blue suit a brighter blue and started the medium blue dinner suit fashion trend. 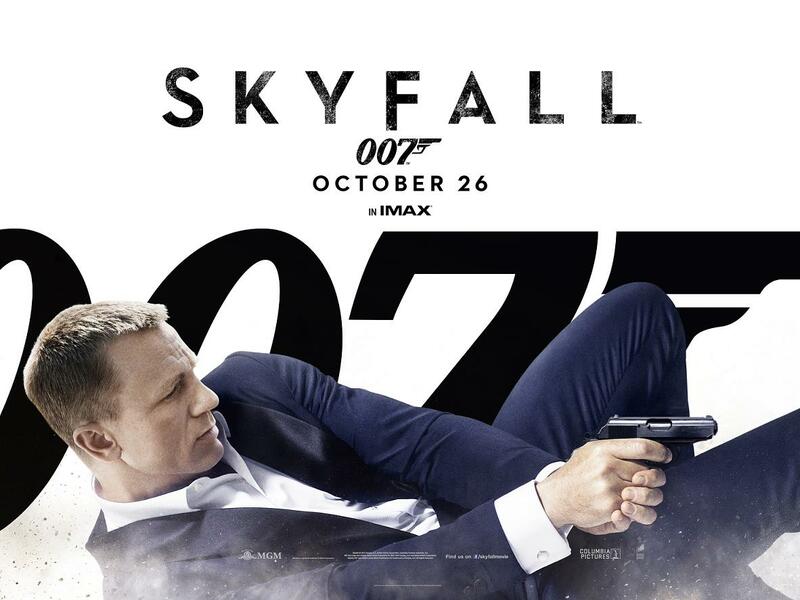 I enhanced the colours of the Skyfall dinner suit in the film to match the poster, which is overexposed. This is NOT the true colour of the dinner suit. 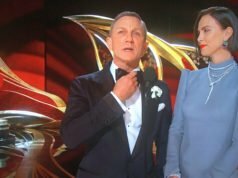 Because Skyfall is the first time that many people noticed that James Bond wearing a blue dinner suit, the dinner suit is regarded as unique because of its colour. But there’s nothing special about it for Bond, who has worn more dinner suits in midnight blue than in black. The midnight blue dinner suit for Bond goes back to the first Bond film, Dr. No. Since then it has been featured in the Bond series at least once every decade. Skyfall is not even the first time Daniel Craig’s Bond wears blue for black tie. He wore it previously in Quantum of Solace, but nobody noticed it because it looks like a very dark, true midnight blue on film. 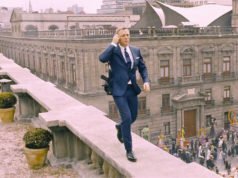 Thanks to the Skyfall poster, medium blue and midnight blue dinner suits alike have been more available in accessible ready-to-wear lines. Midnight blue is no longer exclusive to bespoke and made-to-measure clothes or the most premiere ready-to-wear brands like Tom Ford and Brioni. One can never go wrong with a midnight blue dinner suit, which has been a classic garment since the 1930s. As for medium blue dinner suits, they are more current fashion than timeless and will likely be remembered as a style of the 2010s, just like the powder blue tuxedo will be a relic of the 1970s. Black tie is supposed to be all about the elegant contrast of black and white, and with a medium blue suit the outfit has less contrast and loses some of the elegant simplicity. Because proper midnight blue is so dark, the full contrast is still present just like it is with black. A man in black tie is traditionally a backdrop for his date, hence the limited colour palate. A man cannot be a backdrop in a medium blue dinner suit, but if your date wants you to dress boldly or if you’re single and want to stand out, the medium blue dinner suit can be effective. Medium blue looks rather strong for a whole suit, but it works well as a dinner jacket in fancy materials such as velvet or silk, in which case it should be paired with black evening trousers. In worsted wool or a mohair blend, the medium blue dinner jacket should be paired with matching medium blue trousers. A true midnight blue dinner jacket, which is effectively black, should be paired with matching midnight blue trousers because black trousers will create a mismatched effect. Fantastic article Matt. It’s surprising that some people would confuse midnight blue with something like a light coloured blue than a deep blue which looks closer to black (blacker than black under artificial lighting). Do you think a medium blue dinner suit (made of worsted wool or mohair blend) or jacket (made of silk or velvet) with formal black trousers are great alternatives to wear for nights out and perhaps creative black tie? Yes, it is a good choice for creative black tie. Great article! Very informative for the uninitiated. I have just acquired a midnight blue shawl collared dinner suit so this article is good timing! Going for the Thunderball look. It’s at the tailor right now. I found the buttons to be disappointing so I’m now hunting for true midnight blue satin/silk covered buttons (front and sleeve) so Matt if you or any of your readers are aware of a resource the drinks are on me! The Lining Company sells them. You could also go the Douglas Hayward route and use black horn so you don’t have to worry about a perfect match. Those links look very promising Matt thanks. I’ll let you know how they work out. Rod, why were the buttons disappointing to you? Nice jacket but boring plastic buttons. There are so many subtle ways that set a dinner jacket apart from a normal suit jacket (shawl collar, silk facings, jetted pockets, no flaps, no vents etc and silk covered buttons is one more way to dress it up. Plastic buttons can work I suppose but just seem a bit pedestrian. Like wearing your work shoes with your dinner suit. Plastic or Bakelite buttons were pretty common at one point. Cary Grant’s dinner jacket had them in at least one film which Matt covered. But they will never look as interesting or high quality as polished horn, which I think is a good alternative to facing covered buttons. So is the rule, that the color of the bow tie must match the lapels still stand in a midnight blue dinner suit? What if the lapels were also midnight blue should the bow tie also be midnight blue as well? i ask because you did mention that black means black tie . The bow tie should match the lapels. If the facings are midnight blue, the bow tie should be midnight blue. Remember, midnight blue can look black under artificial light, so it is essentially a form a black. I find that black bow ties clash with midnight blue facings because there is only a slight difference. If you unable to source a proper midnight blue bow tie, a black bow tie is better than navy. If your suit is a lighter shade of blue and the facings are also a lighter shade of blue, then wear a black bow tie. One of my favorite ever black tie looks is the one in Thunderball. That’s what I’m emulating. IIRC Matt you wrote that he wears a black tie even though suit and facings are midnight blue. I have a hard time distinguishing the two colours, (either in real life or on the telly!) but I have narrow batwing ties in both black and now midnight blue (yet to be deployed) from The Tie Bar of all places. In the Thunderball example I can see that the lapels are midnight blue but the tie is black. Distinguishing the two is only possible when they are up against each other. I believe that it’s ideal to match a midnight blue bow tie to midnight blue facings, but black can make due. Are you familiar with the shawl collared dinner suit offered by Mason & Sons in their website? Is that true midnight blue? I have not seen it in person, but on the website it looks to be true midnight blue. Richard James and I have been big proponents of midnight blue mohair dinner suits for 20 years. I remember when sold of the rack at RJ they were a niche color and it was impossible for the “uninitiated” to come round to the idea to a dinner suit that was not black. Since skyfall I do nearly as many midnight blue dinner suits as black. I always turn my clients on to real midnight blue though especially Dormeuil’s Tonik mohair. What’s your take on a navy dinner suit with black facings? Stylish or just off? Waht do you think about center vent in a tuxedo? I do not like a centre vent in a tuxedo. It is too sporty. It should have double vents or no vents, which are more formal styles. This conversation just puts me in mind of the “none more black” scene in Spinal Tap..!